Entrance to the Rose Kennedy Memorial Rose Garden. Pictures of the roses in color can be seen here and here. Other monochrome pictures can be seen at The Monochrome Weekly hosted by Aileni. I love it en sepia. Beautiful bench too! this is so unique, almost surreal. I love the sepia effect. This is a good and nice idea. Timeless - there should be a carriage. Very good, a really plausible sepia! How could I not love this picture!? The sepia makes this bench verrrrry romantic! 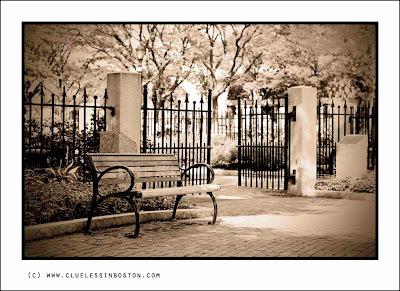 The open gate invites us in - the bench is there for us when we leave. O, I really like this image. The soft sephia effect is lovely. And so is the bench. A lovely old fashioned feel about it. Very delicate and artful photograph, real pleasure to contemplate! I agree with the others. This is a very successful image in every way. Was it taken recently? A very nice tone to this image. This is a respectful scene for Mrs. Kennedy with solid gates and a real park-like setting. Her rose is gorgeous. Love the tones in this black and white. Nice post! It's lovely, the open gate invites us in. I'd like to think someone might make a memorial rose garden for me one day...or even one bush? Normally I am not a sepia lover but this works perfectly! Lovely effect. Looks a very peaceful place. Almost looks snow-covered... I don't even want to think about that! I really like this soft light and sepia colors. It suits perfectly to the ambiance of the picture. Can I ask you how you achieved it? Oh I love this one. It's perfect. One of the nicest sepia photos I've seen! this picture brings a romantic feeling inside our heart!Fabulous sepia, congrats!